ArrayBlockingQueue implements the BlockingQueue interface. 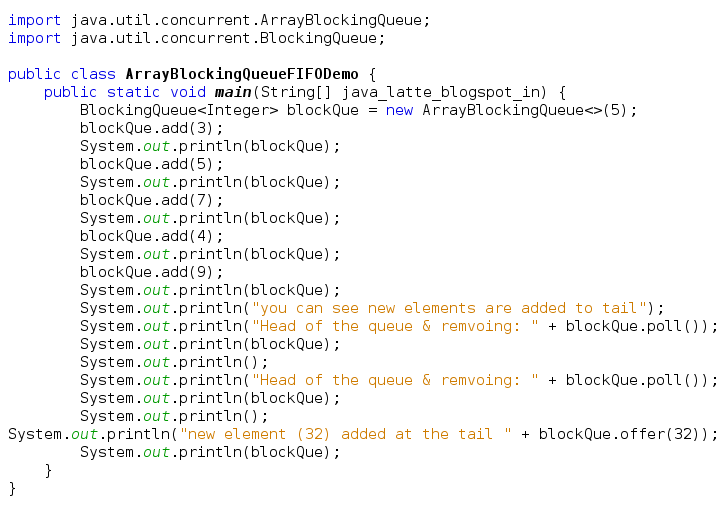 Before moving further, please a look at the BlockingQueue interface that help you better understand ArrayBlockingQueue and it's methods. A bounded blocking queue backed by an array. 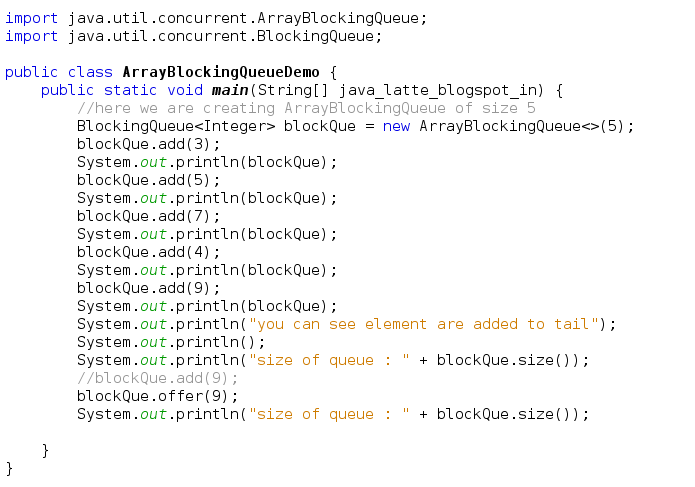 It store the element internally in an array.That why is it called ArrayBlockingQueue. This is a classic "bounded buffer", in which a fixed-sized array holds elements inserted by producers and extracted by consumers. Once created, the capacity cannot be changed. Attempts to put an element into a full queue will result in the operation blocking;attempts to take an element from an empty queue will similarly block. We'll see an example of this also. boolean add(E e) Inserts the specified element at the tail of this queue if it is possible to do so immediately without exceeding the queue's capacity, returning true upon success and throwing an IllegalStateException if this queue is full. boolean offer(E e) Inserts the specified element at the tail of this queue if it is possible to do so immediately without exceeding the queue's capacity, returning true upon success and false if this queue is full. void put(E e) Inserts the specified element at the tail of this queue, waiting for space to become available if the queue is full. This example demonstrate the difference between add() and offer() method. You can see, add() method is throwing IllegalStateException because it's trying to increase the capacity of the queue. This example demonstrate how FIFO order is follow while adding and removing element from queue. 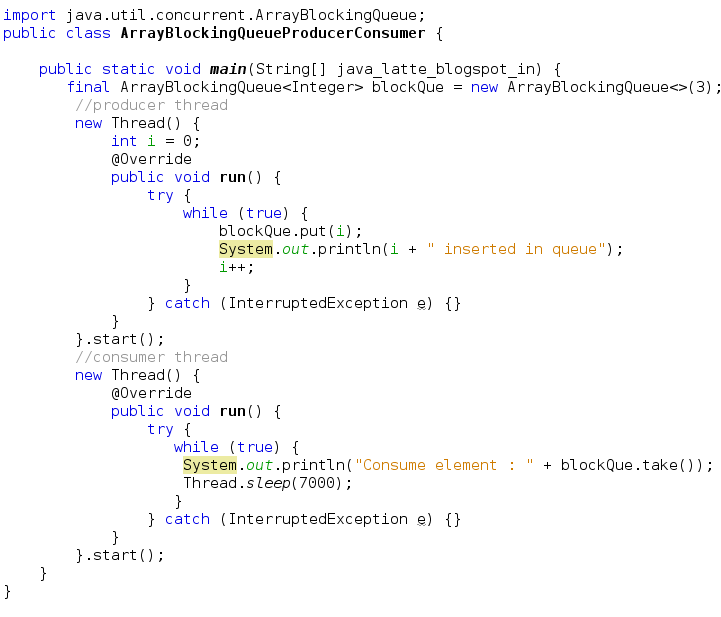 In this example, we create ArrayBlockingQueue of size 3 in which producer insert element in a while loop and consumer thread consume element in a while loop. In while loop, if we insert more than 3 element it blocks until consumer consume element from the same queue. You'll notice from the above output that queue was bounded to 3 element at a time that how it's differ from unbounded queue where producer produce element without waiting. You can try the above code by changing queue size to 1. where only element will be in a queue until consume by consumer.